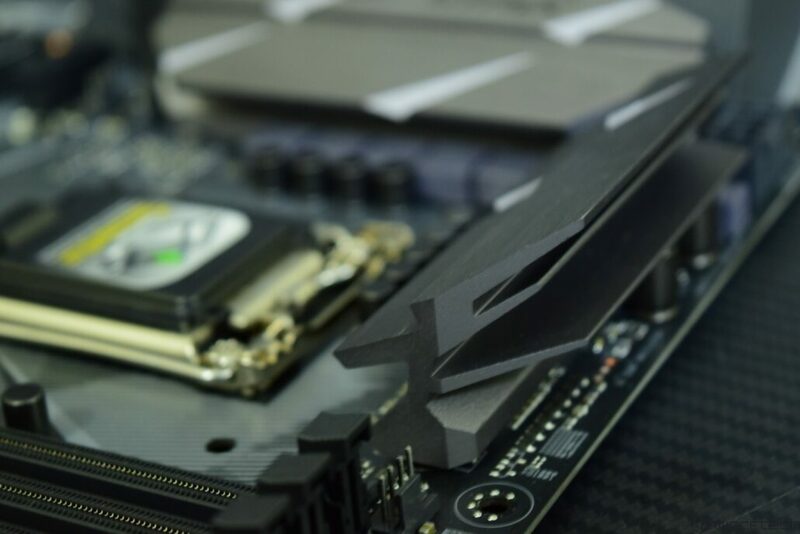 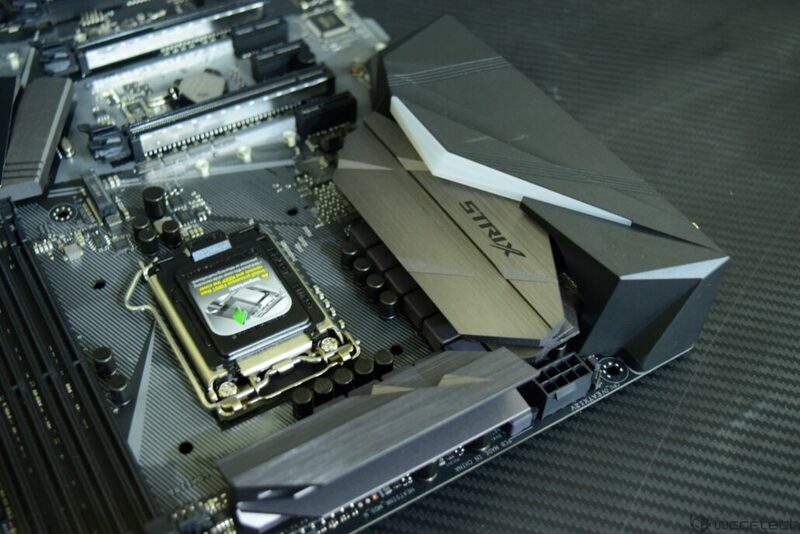 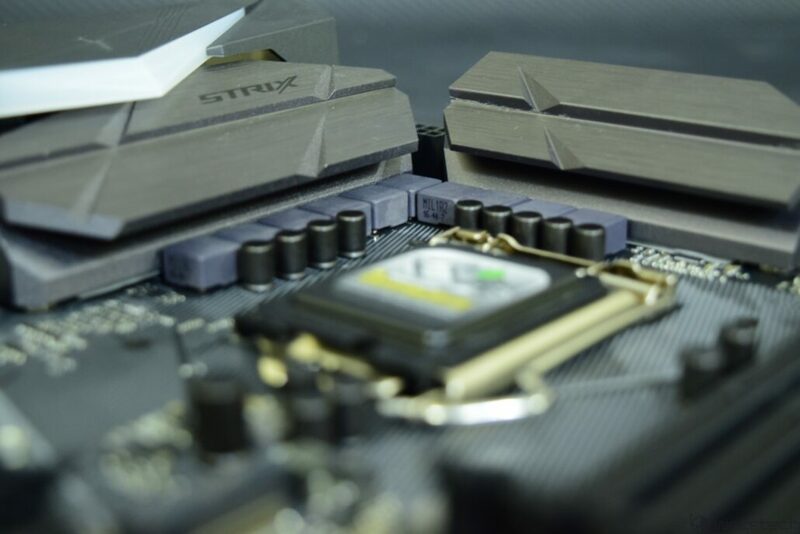 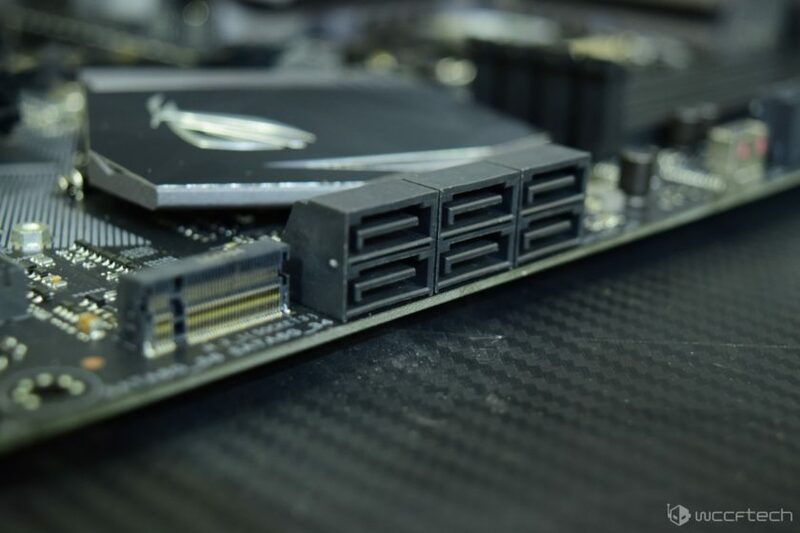 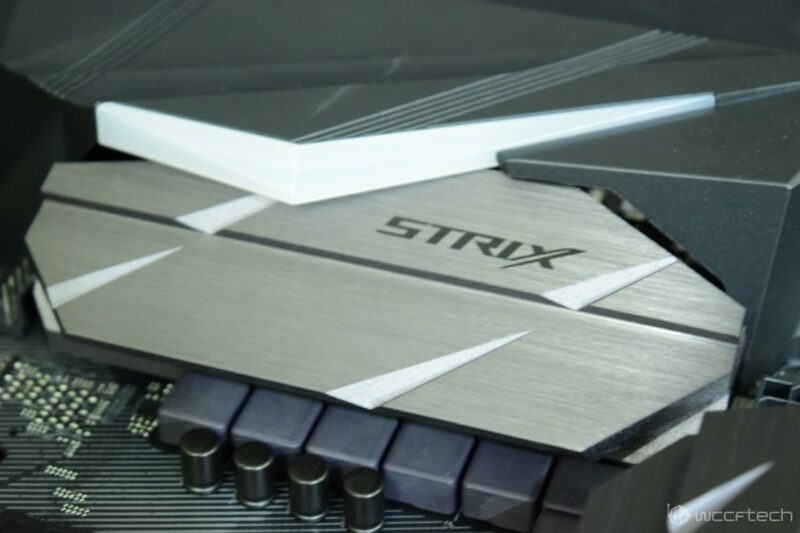 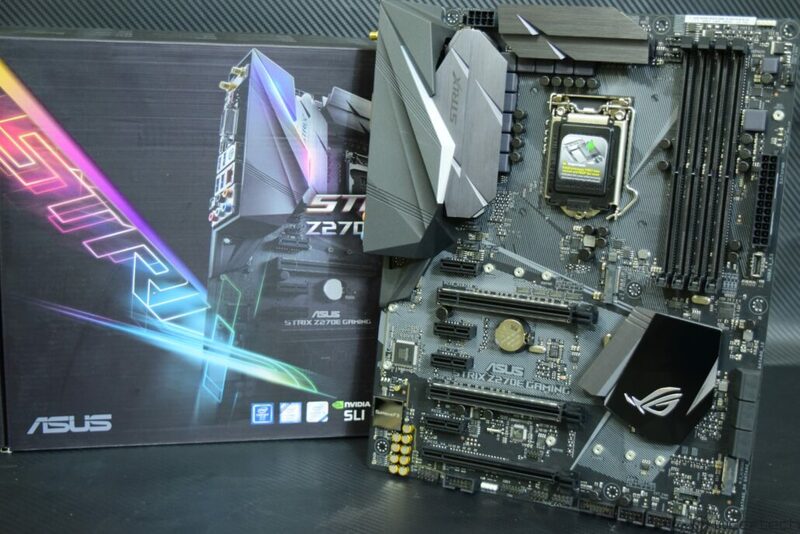 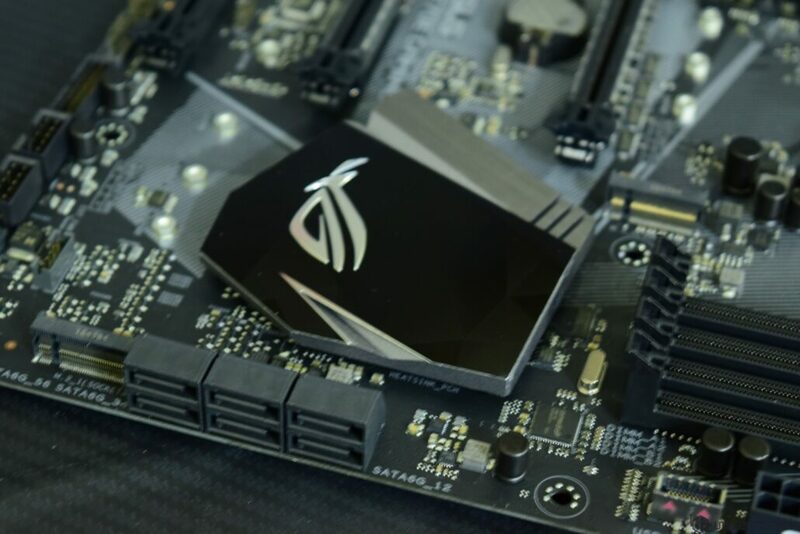 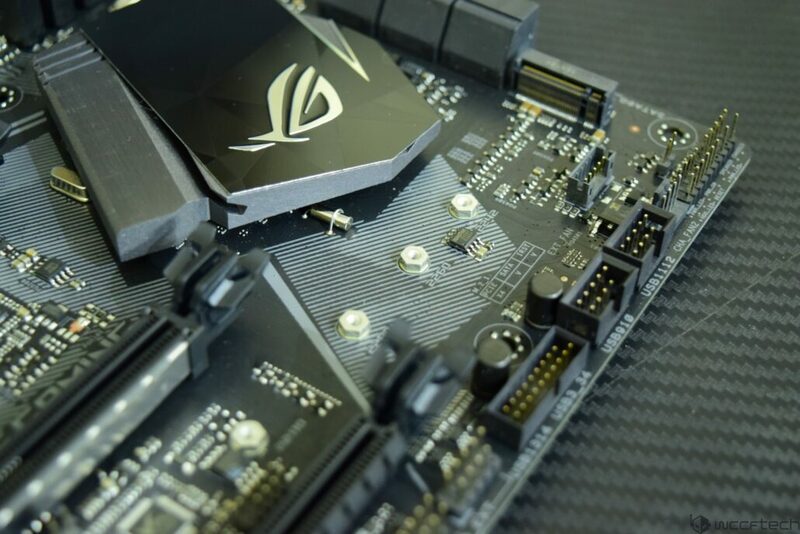 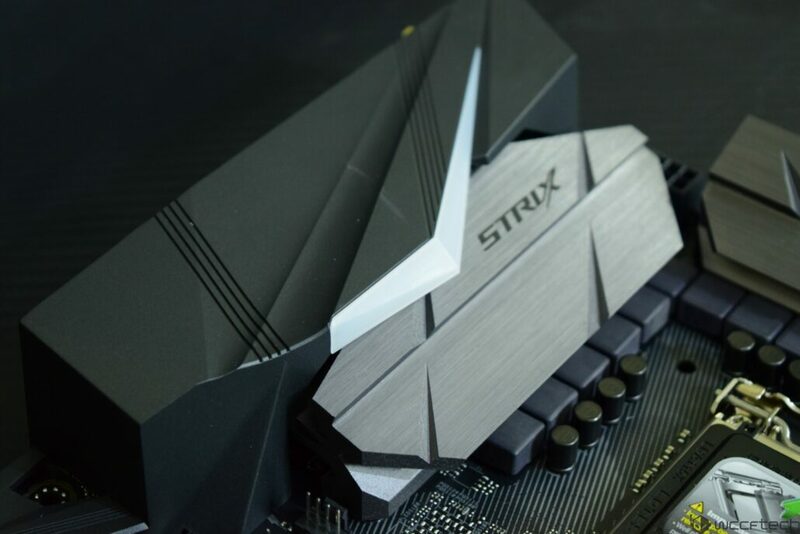 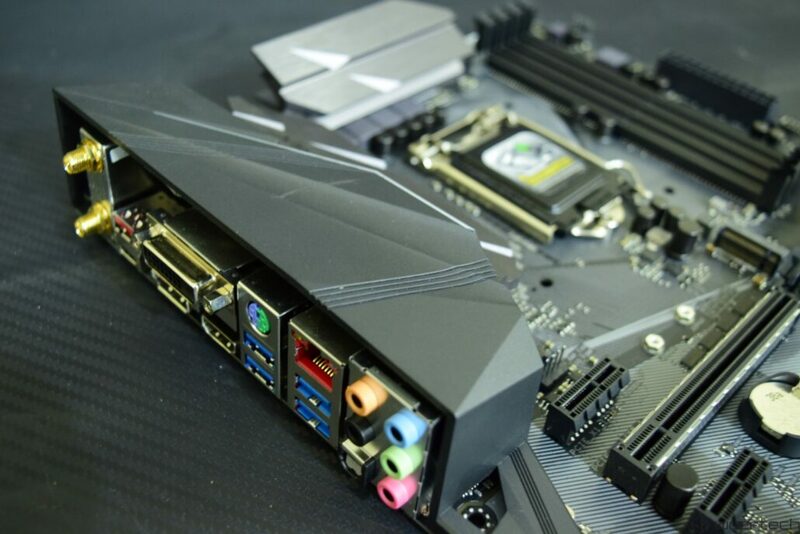 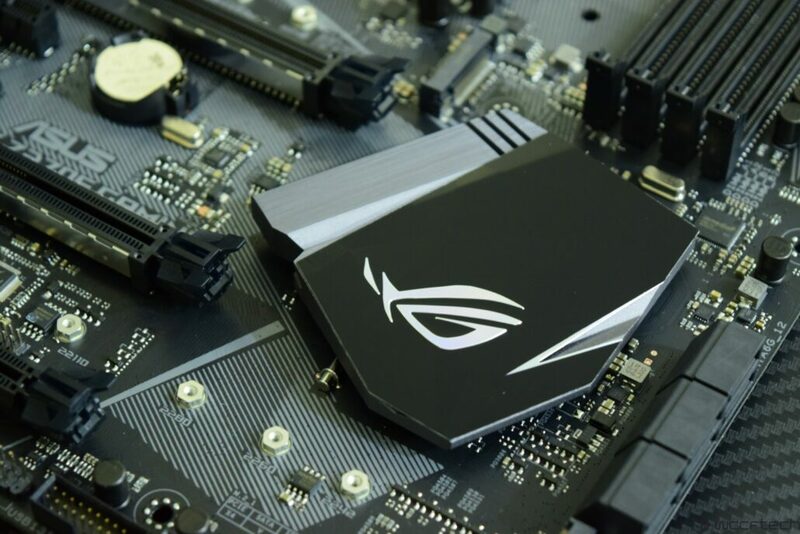 The ASUS ROG STRIX Z270E Gaming is a standard ATX form factor motherboard that utilizes a matte black color for the PCB and brushed metallic silver/black combination for the heatsinks. 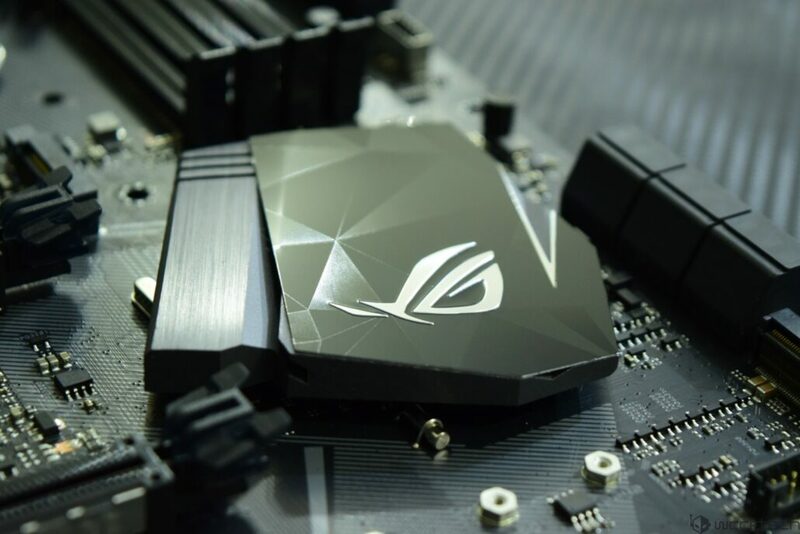 It has a ton of features for the price it should hit retail for so let’s get started. The board uses the LGA 1151 socket to support Intel Core processors. 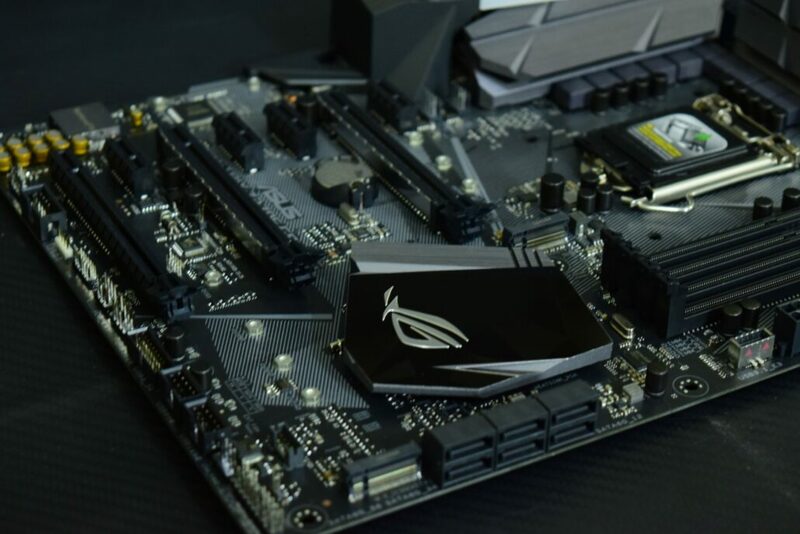 The socket is compatible with both Intel 6th Gen (Skylake) and 7th Gen (Kaby Lake) processors. 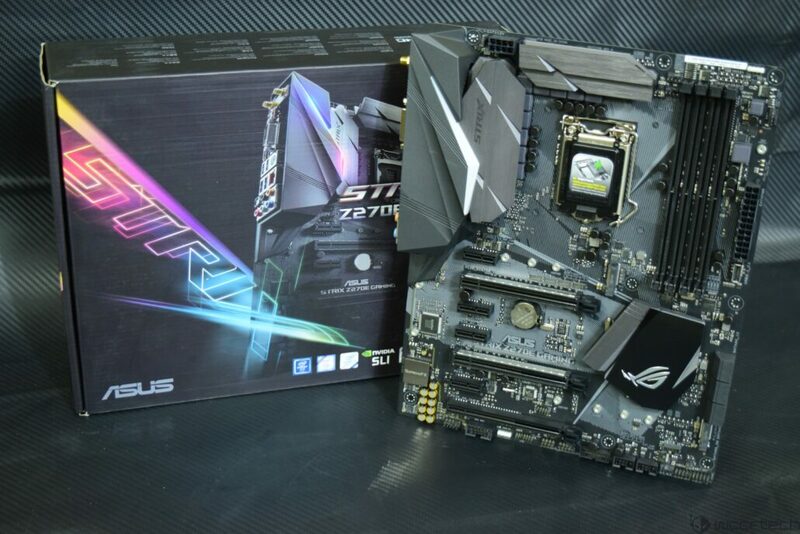 The socket has a protective cover out of box which can easily be removed when installing the processor. The ASUS ROG STRIX Z270E Gaming packs a semi-8+2 Phase (CPU+iGPU) Digital power design. 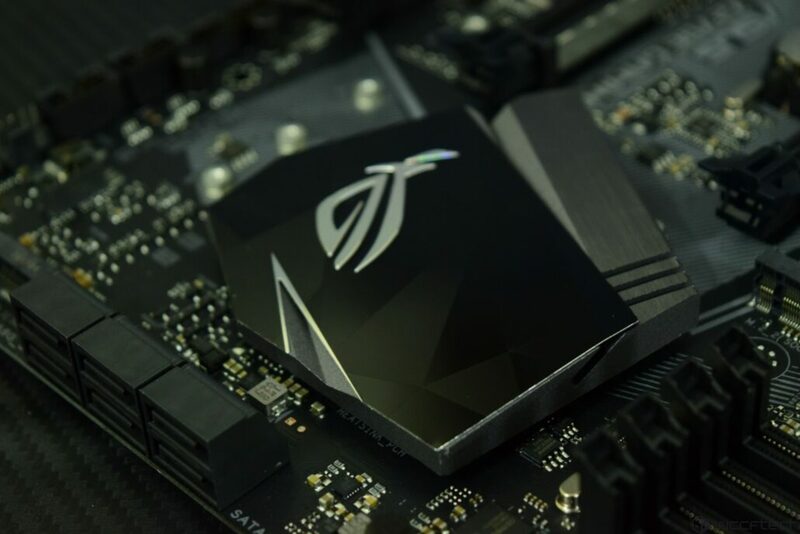 The design is packed with 2 phase power for the DRAM and uses 10K black metallic solid-state capacitors. 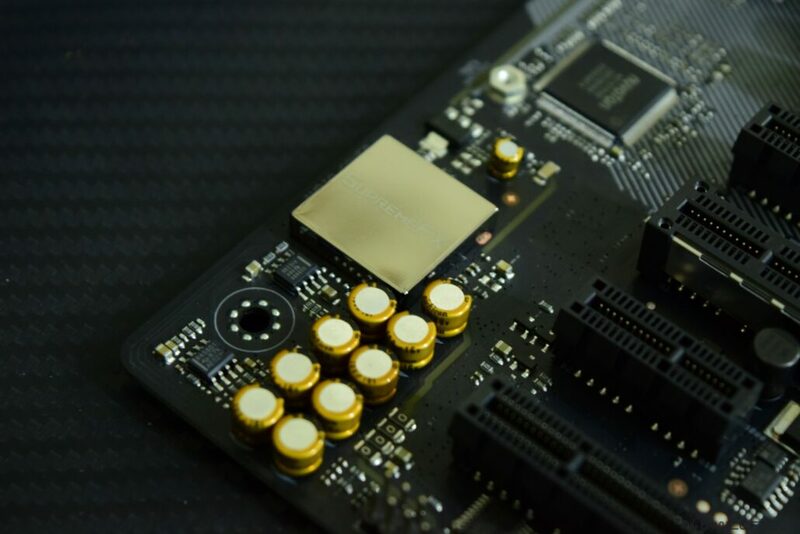 The board also features a powerful Digi+ Power Control Utility for advanced tuning and configuration routines, ESD Guard, DRAM Fuse and Active Frequency Mode. 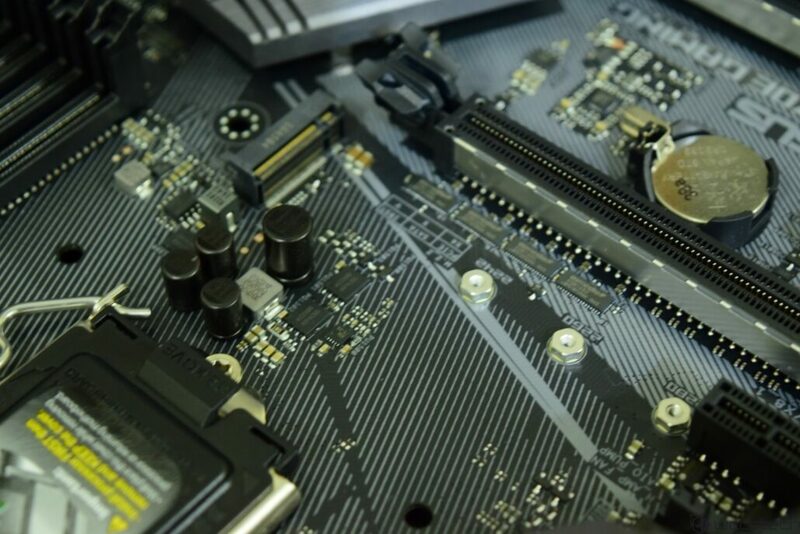 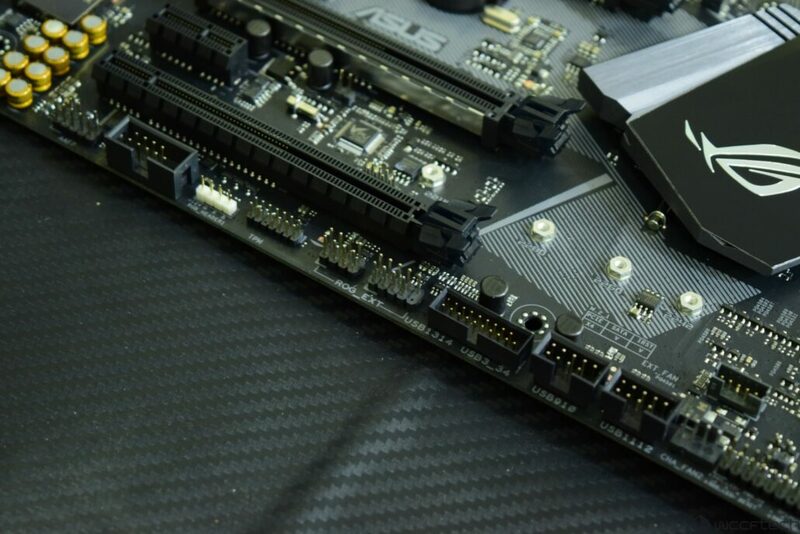 The motherboard is covered by an aggressive I/O cover that comes in black color. 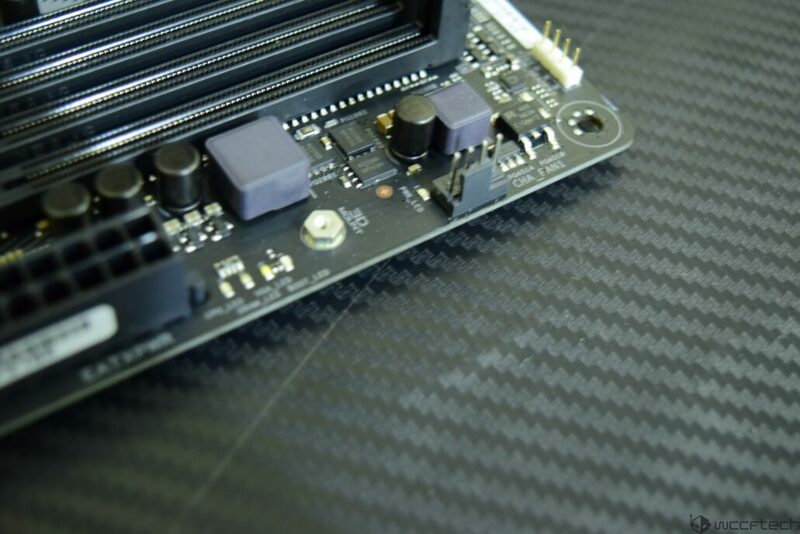 This I/O cover acts as a shield to protect the I/O panel from electrostatic discharge. 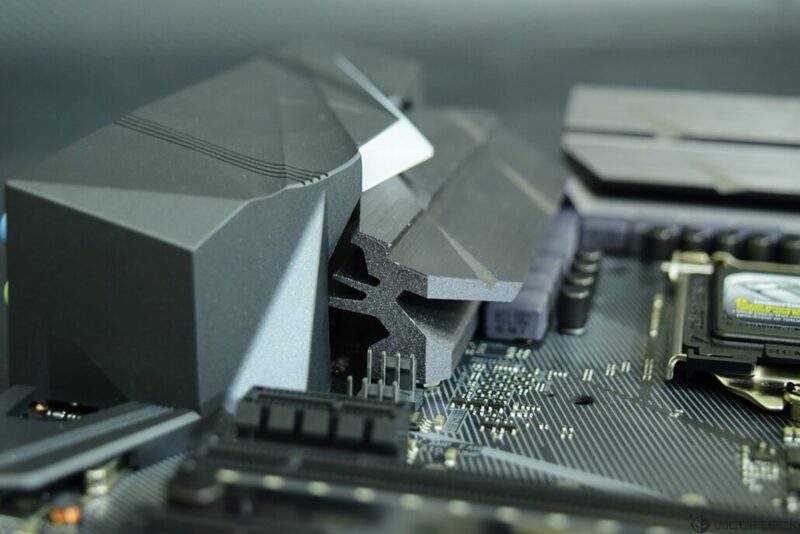 As you can see, the VRMs are getting ample cooling from the two metallic heatsinks that are beefy in terms of overall size. 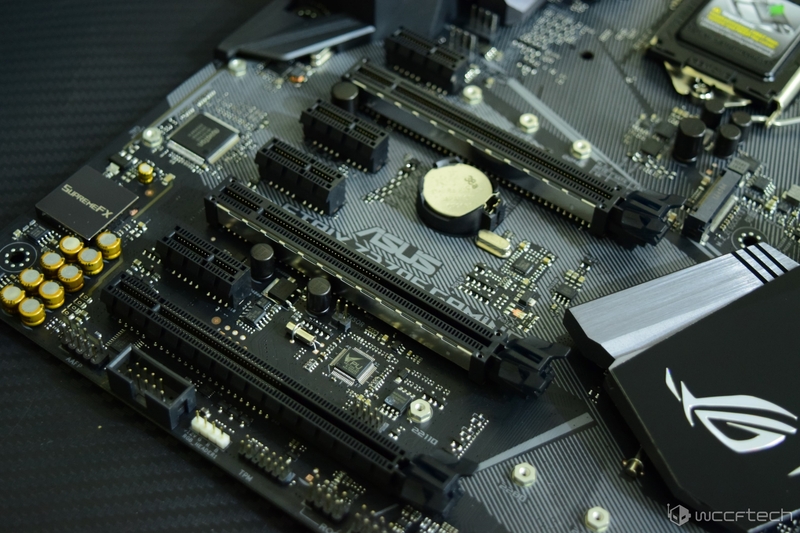 This motherboard is designed for overclocking so expect stable operation of the electrical circuitry when this board is running. 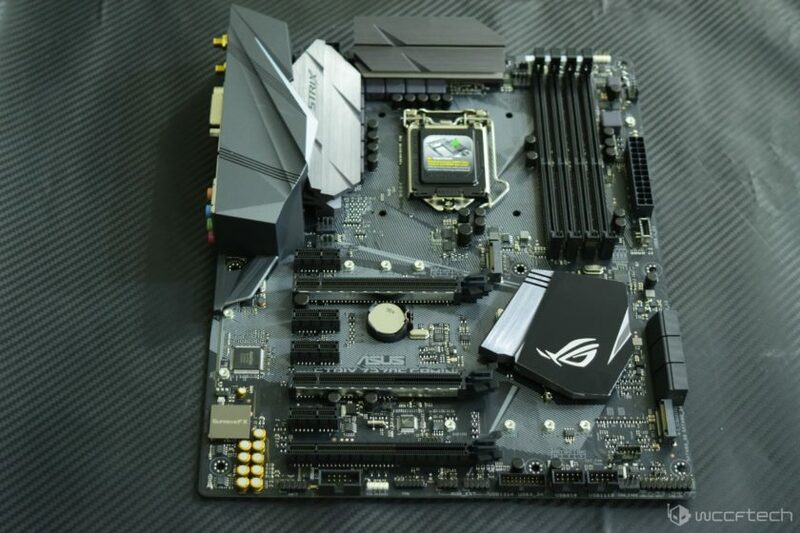 The top I/O cover and the cut marks on the heatsink feature ASUS AURA LED system so expect some lightning action when the board is up and running. 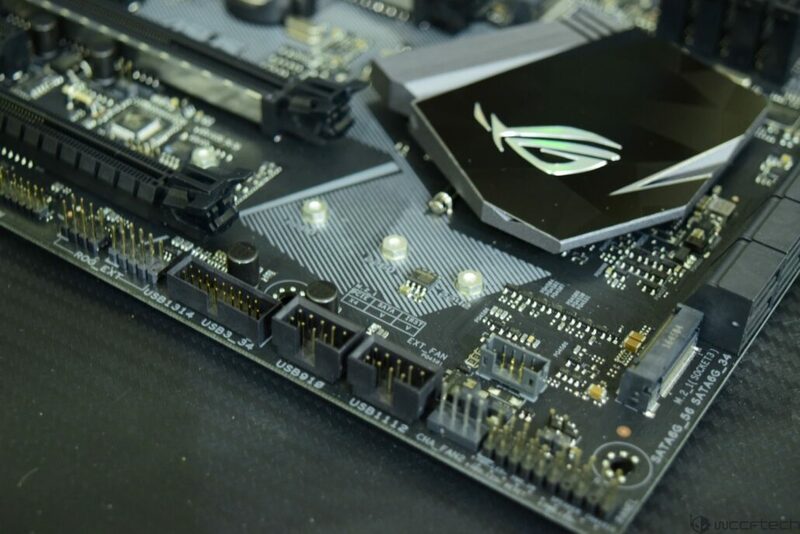 The CPU is supplied power through a single 8-Pin power connector. 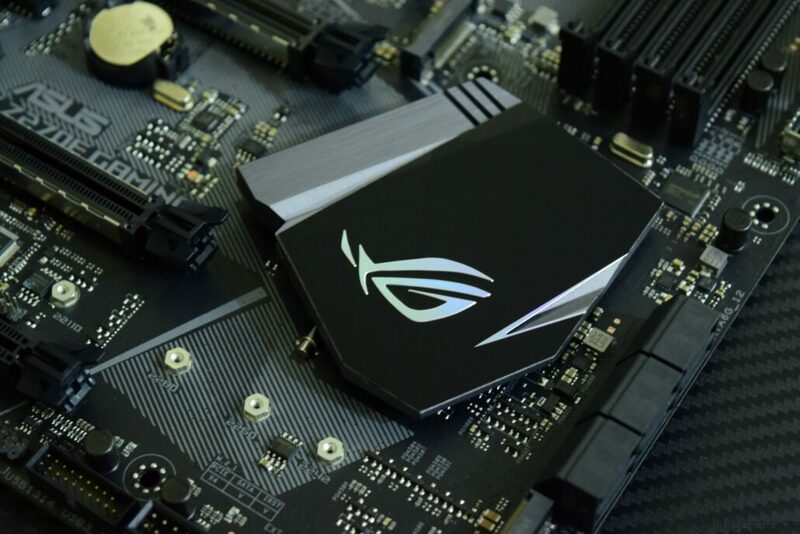 This will feed the CPU with up to 150W of power. Most Intel CPU’s will be shipping with TDP’s under 100W but that changes when users overclock, that changes power limit based on applied voltages and clock speed. 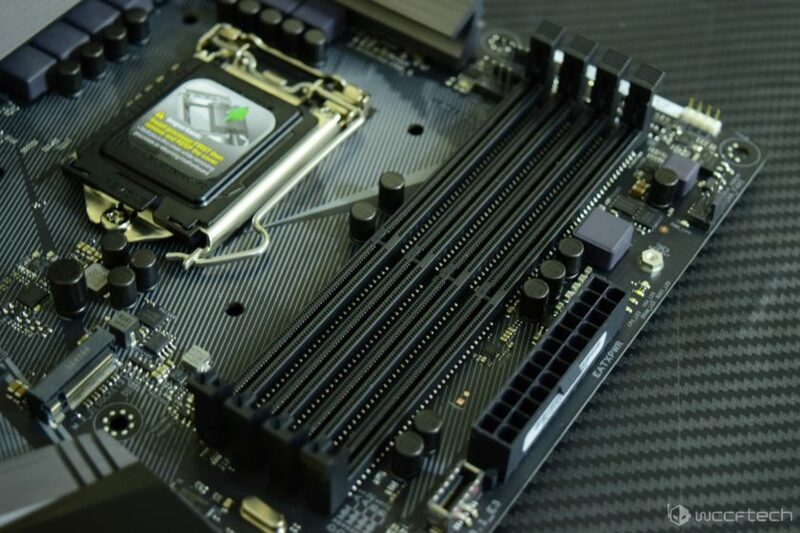 Next to the socket are four DDR4 DIMM slots which can support up to 64 GB (Dual Channel) memory. 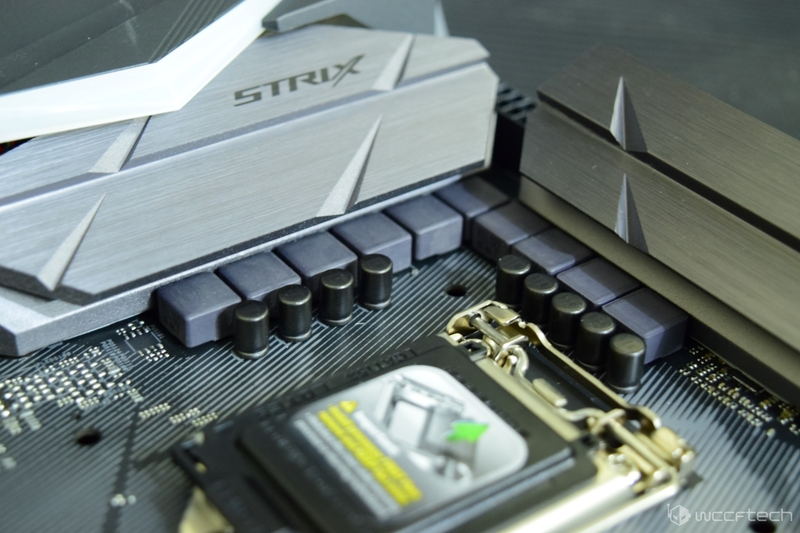 These slots are rated to support XMP profiles up to 3866 MHz. 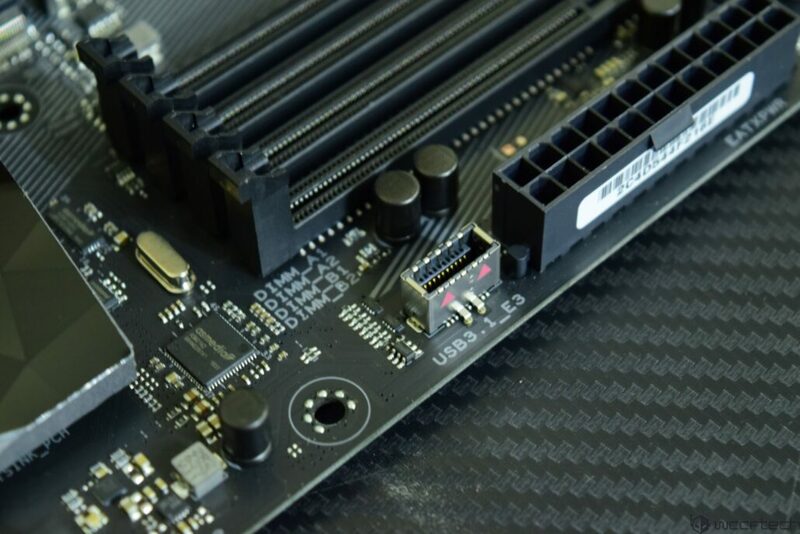 Each slot is labeled, making it easier to install DIMMs in the proper orientation. 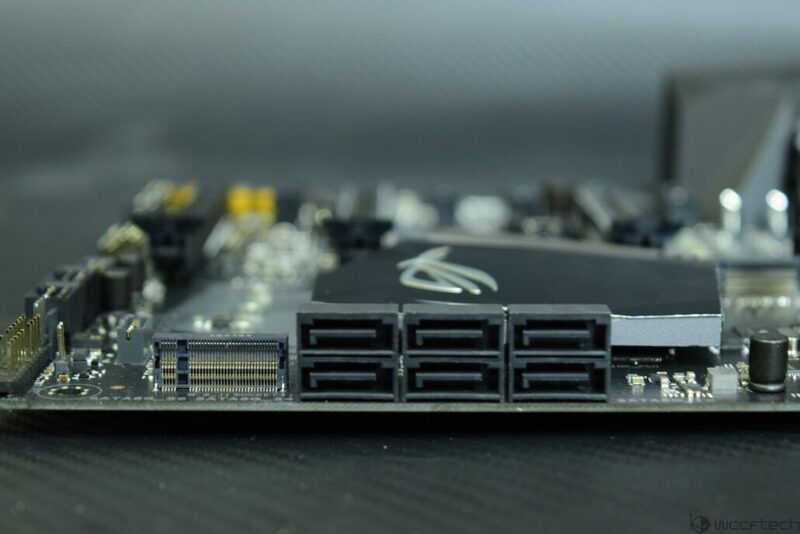 Expansion slots include three PCI-Express 3.0 x16, three PCI-Express 3.0 x1 and two M.2 slots. 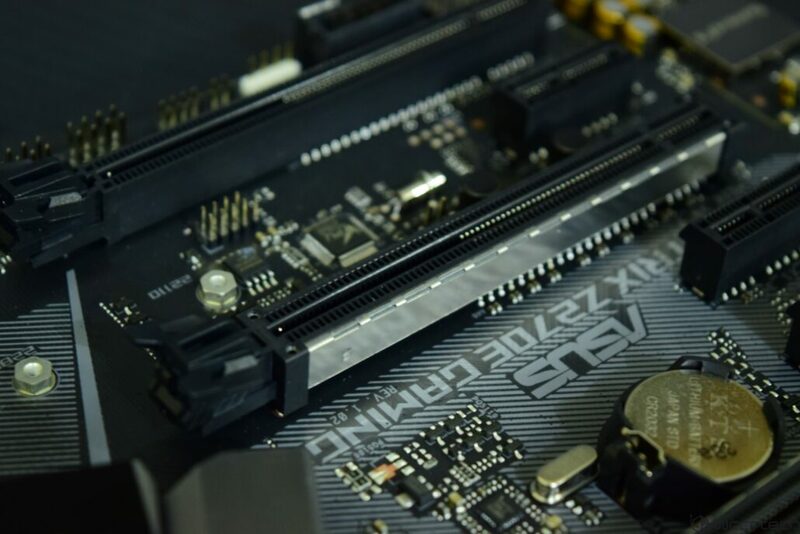 The board can support 3-Way multi-GPU (CrossfireX / SLI). 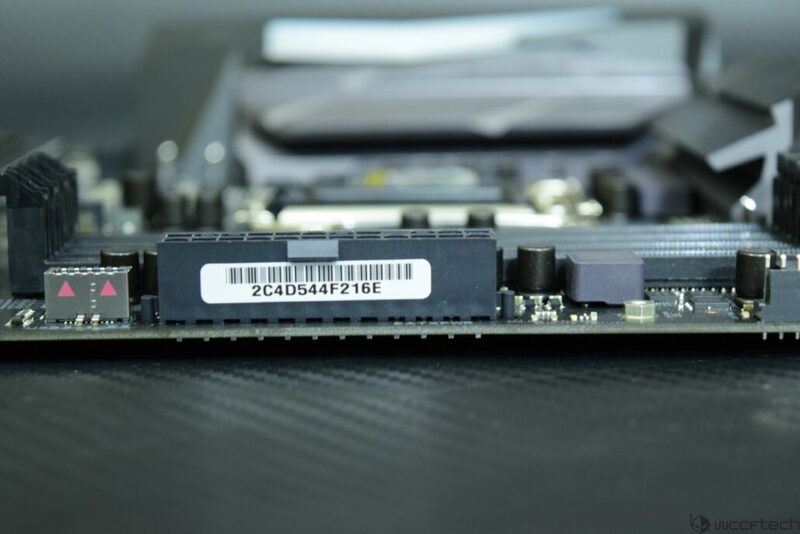 The M.2 slots are rated to support NVMe PCI-e Gen3 x4 and Intel Optane series memory. 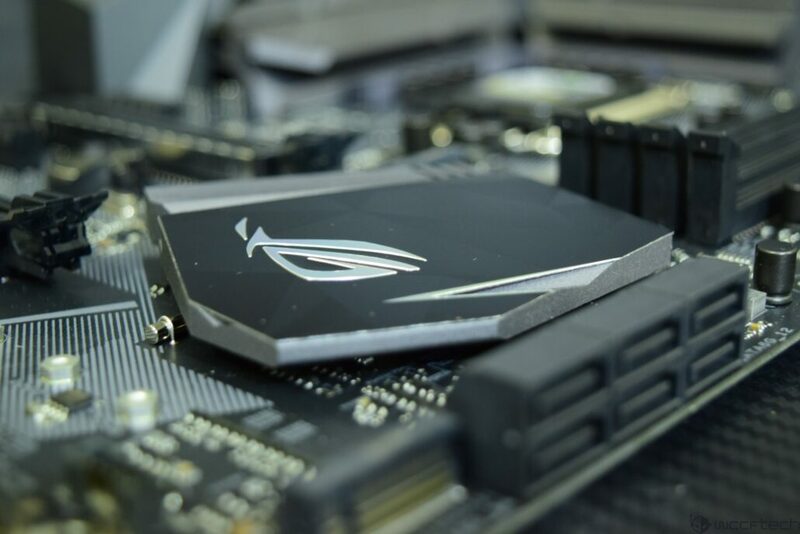 ASUS is using a metallic cover on the sides of the expansion slots which provides protection to some extent. 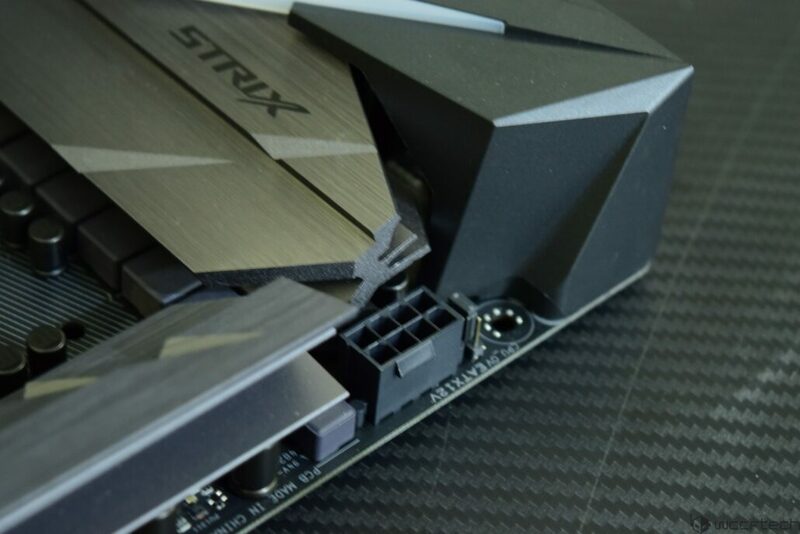 It adds more retention and shearing resistance by reinforcing the slots with metal plates. 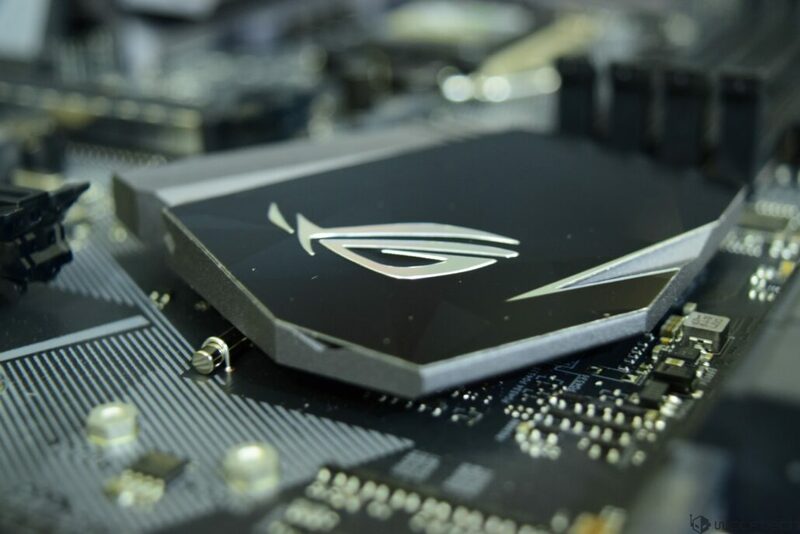 Aside from adding more protection, they do look really sweet. 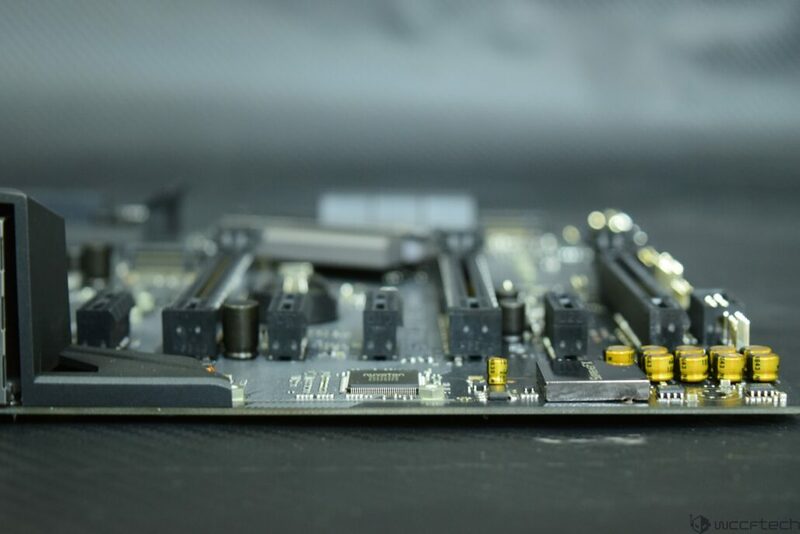 The first M.2 slot is housed right next to the top PCI-e 3.0 x16 slot. 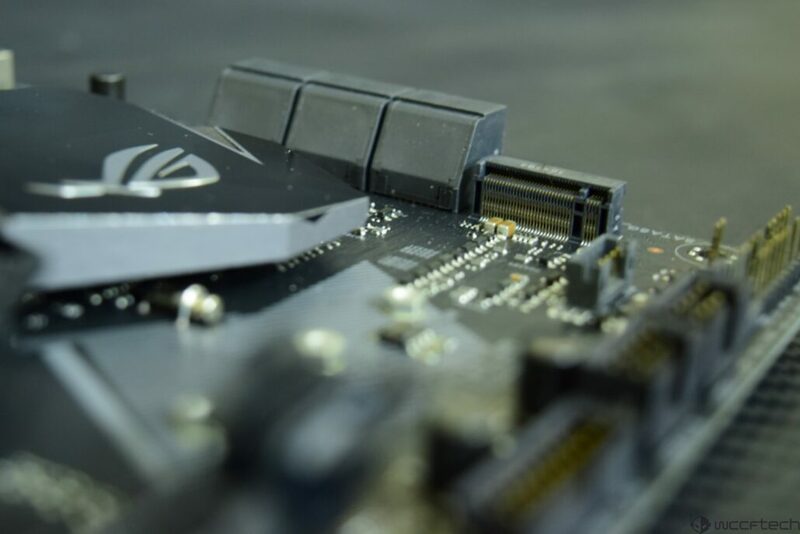 The M.2 slot can support drives with speed of up to 32 GB/s. 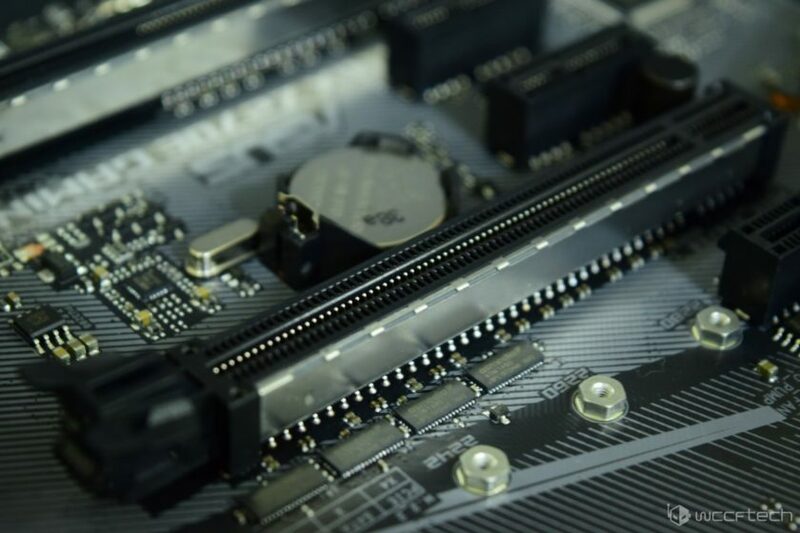 The second M.2 slot is ideally positioned beneath the PCH heatsink. 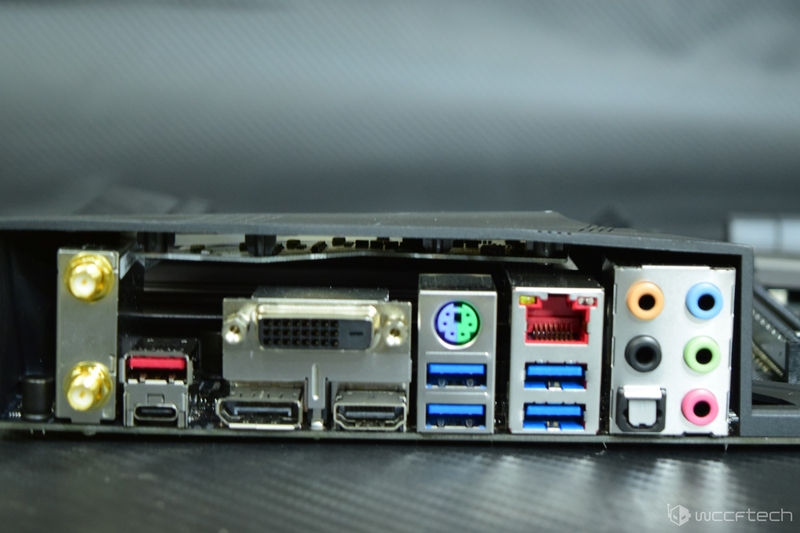 Both M.2 slots can support devices with up to Socket 3 Type M compatibility. 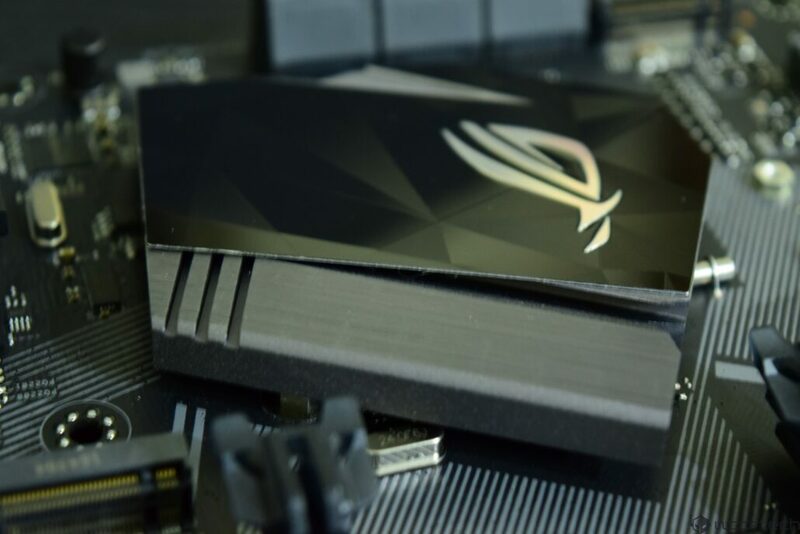 The ASUS STRIX Z270E Gaming falls in the ROG lineup and hence features the iconic ROG Eye logo on the heatsink. 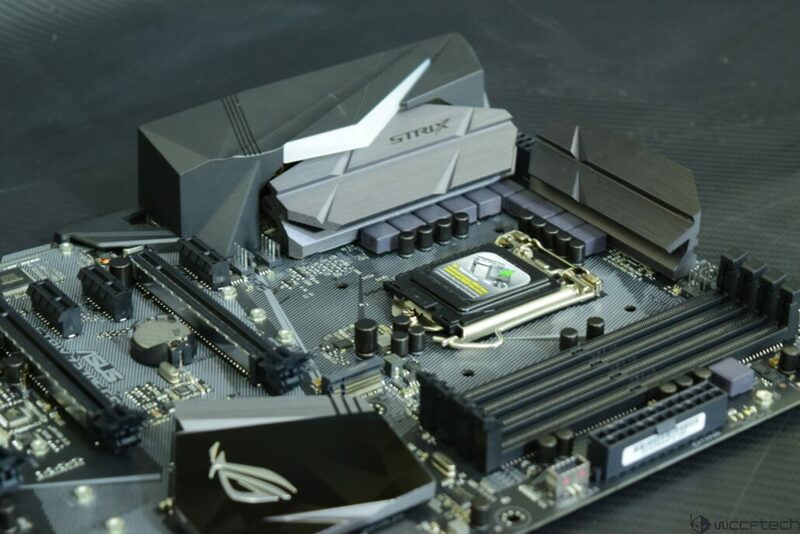 This heatsink is part of the AURA lightning system and can lit up in several choices of colors. Storage options include six SATA III ports rated to operate at 6 GB/s. These can support 6 different storage devices at a single time. Many overclockers have to use a USB connection without reaching the back of board. 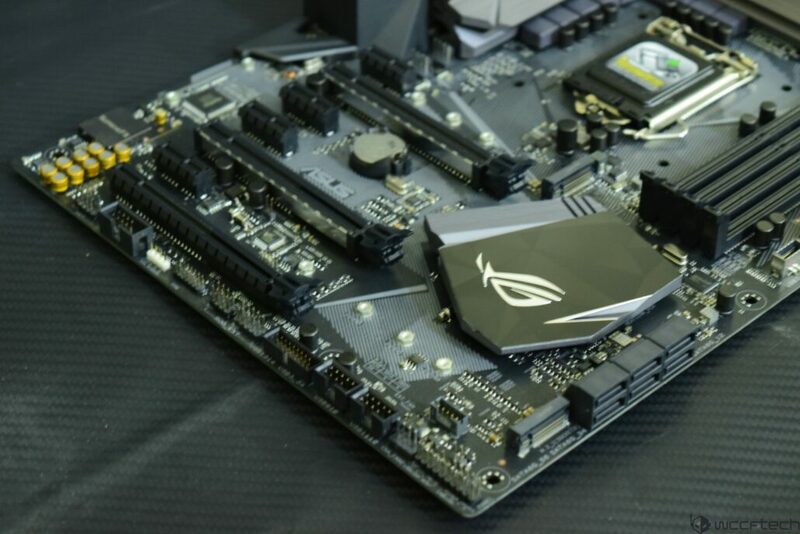 ASUS addresses this with a front panel USB 3.1 port that is located beneath the 24-pin ATX connector. The bottom headers include two USB 2.0, a single USB 3.0 and a audio connector. There are also ROG external connectors and a few 4-pin fan headers located on this part of the PCB. 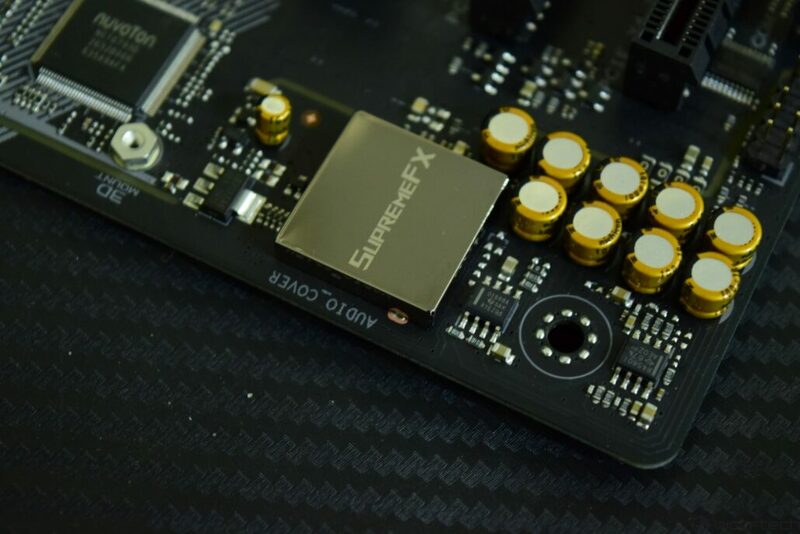 The SupremeFX onboard system powers the audio on this board. 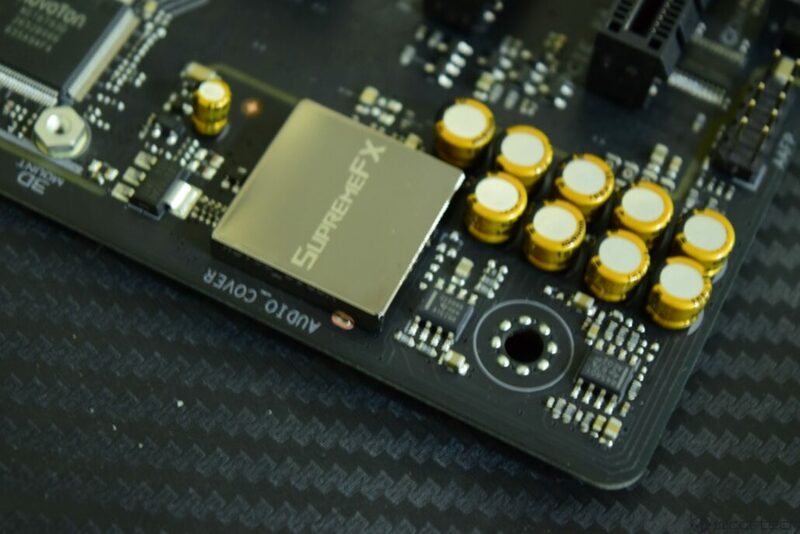 The most unique component that was added to the solution on this generation is the SupremeFX High Fidelity HD Audio S1220. This new codec features an unprecedented 113dB SNR line-in and 120dB SNR line-out that allows users to stream and record with minimal noise. 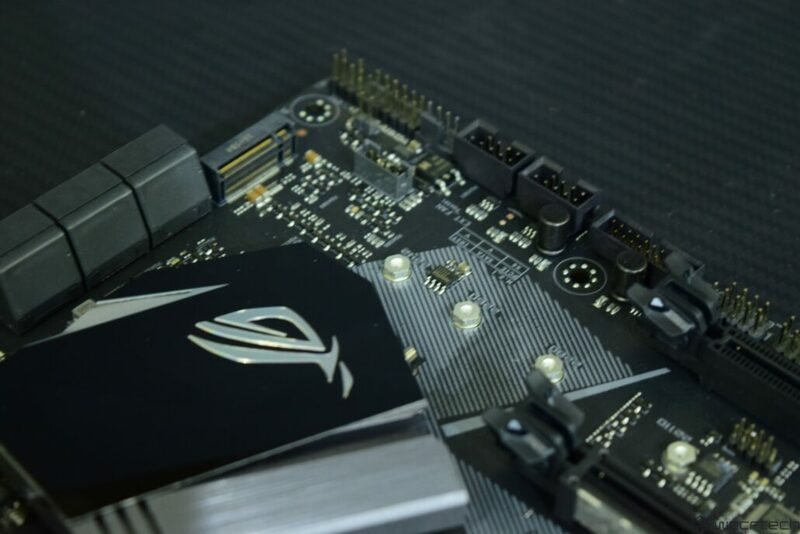 ASUS ships the ROG motherboards with a WiFi antenna module which looks cool. 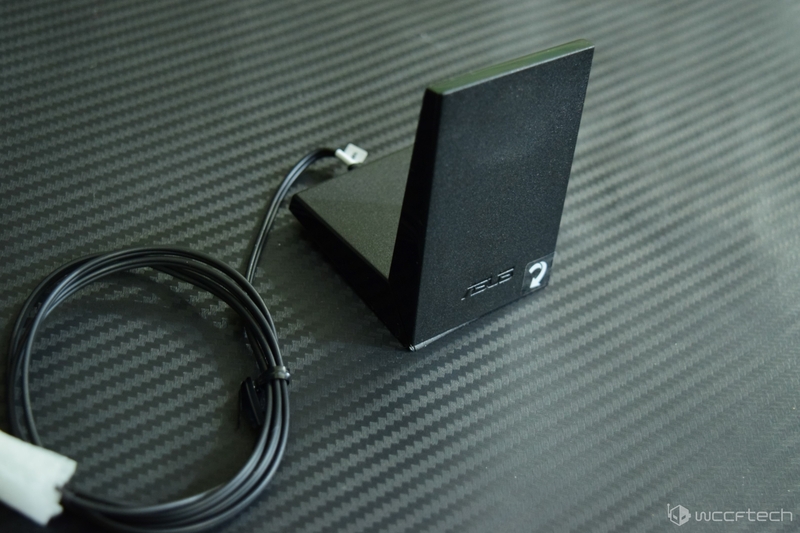 This module can be adjusted to user preferences and needs to be attached to the Wi-Fi MU MiMO module on the back panel. 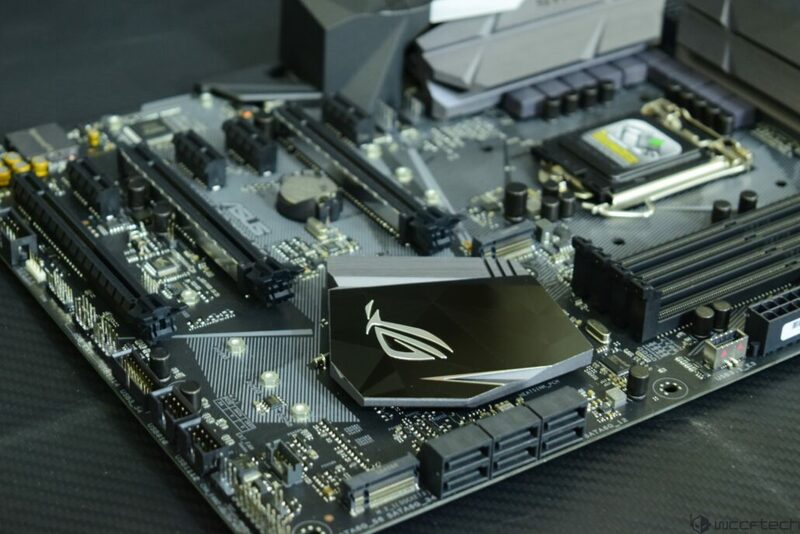 Finally, we have the I/O panel which includes the ASUS Wi-Fi 802.11 a/b/g/n/ac module, ROG Connect Switch, Reset Switch, two USB 3.1 (Type A + Type C), four USB 3.0, Gigabit Ethernet Port, PS/2 port, HDMI, DP, DVI port and a 7.1 channel HD audio jack.